In this exhibition Alison Mackay has focused on objects from everyday life in her paintings. Fish, meat, plastic containers, kitchen sinks, cutlery and other ordinary household items feature prominently. 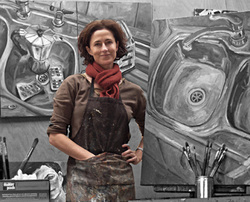 Mackay is best known for her still life paintings, although her naked ‘Work in Progress (self-portrait in the studio)’ won the prestigious Wollongong City Gallery Photographic Portrait Prize in 2008. Her paintings celebrate and explore familiar objects – but often in unusual or unexpected ways. “A closer look at the shapes of kitchen utensils can take you into an intriguing world” says Mackay. “Familiar objects – from food to pharmaceuticals – take on a different life when you start to see them through somebody else’s eyes”. Mackay broke her back some years ago in a horse-riding accident, and blister packs of pain-killers feature in some of her work, alongside plastic ponies, hand tools and a cornucopia of other items. One of Mackay’s kitchen sinks recently won the Shoalhaven Arts Society’s Still Life Prize and a series of paintings of meat were chosen for the Wollongong City Gallery’s 30th Anniversary Exhibition. “Much could be made of Alison’s choice of subject matter (meat, prawns, kitchen sinks and the like) and the feminist reading it could possibly invite. But to me her work is simply about personal space and zones of reflection. It is about the artist in her studio making hand-made images that rely on privacy and poetry for their voice”.